The Canadian Observatory CHIME immediately found 13 new fast radio bursts, one of which is periodically repeated. The description of these new “alien signals” and the findings of scientists were presented in the journal Nature. “So far we have known that there is only one such source. The discovery of the second repeating signal indicates that there should be a lot of them. Finding and studying them will help us solve this cosmic riddle and find out where these bursts come from,” said Ingres Stairs (Ingrid Stairs) from the University of British Columbia in Vancouver (Canada). 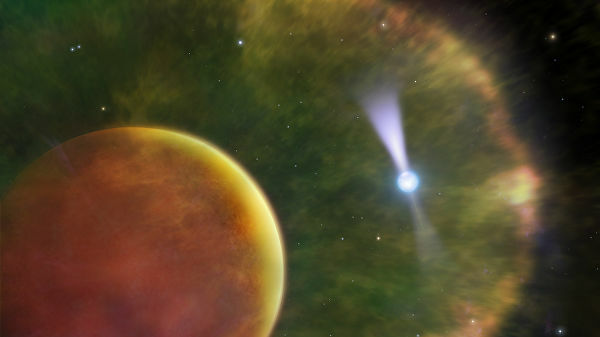 For the first time, astronomers began talking about the existence of mysterious outbreaks of radio emission, FRB, in 2007, when they were accidentally discovered while observing radio pulsars using the Parks telescope (Australia). In subsequent years, scientists managed to find traces of another nine such bursts, the comparison of which showed that they could be of artificial origin and even potentially be signals of extraterrestrial civilizations due to the inexplicable periodicity in their structure. All of them were united by one thing – an extremely large power and an unusually large distance to their sources. Therefore, initially astronomers assumed that such bursts are born in the course of the merger of neutron stars or other compact objects, turning into a black hole. Two years ago, scientists discovered that it was not. The Parks telescope recorded repeated flashes at the point where one of the first bursts was recorded six years ago, FRB 121102. Last year, CHIME discovered a new type of similar signals that had an unusually low frequency. This made the “alien signals” even more mysterious and interesting. Stairs and her colleagues continued their observations, and this summer CHIME managed to immediately find 13 new fast radio bursts at a “new” low frequency of 400 megahertz. These observations revealed several interesting details and brought one big surprise. One of the new flashes, FRB 180814, discovered by a Canadian telescope in mid-August last year, turned out to be repetitive. In the next two months, astronomers immediately recorded six new bursts at the same point of the night sky in the Giraffe constellation, where it was recorded for the first time. Like other “alien radio signals”, it originated far beyond our galaxy, at a distance of about 1.6 billion light years. The unusual “smearing” of this flash and some of its other features indicate that it and some of the single FRB bursts discovered by CHIME originated inside the “shroud” of a supernova or near a black hole. Although it was caught on a different frequency, the structure of FRB 180814 is generally almost indistinguishable from what FRB 121102 looks like. Stairs and her colleagues and her colleagues suggest that this is in favor of the similar origin of these mysterious “alien signals”. All these flashes, as the scientists emphasize, were discovered by CHIME before it was completely completed. They hope that the full version of this telescope will be able to open several dozen “cousins” of FRB 121102 and FRB 180814, and reveal their nature. Next story Oceans heat up as if several atomic bombs explode every second.